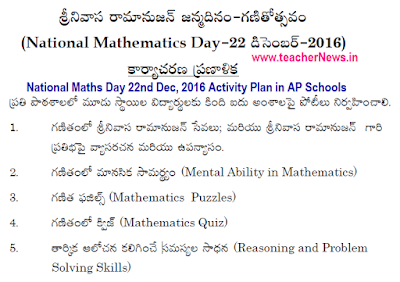 AP / TS School Education Celebrate National Mathematics Day on 22nd Dec, 2016. Day wise Mathematics Day Programme details, Action plan for Mathematics Day on 21-12-2016 and 22-12-2016. Mathematics Day School level Activities, Mandal level Mathematics Day Activities guidelines. AP / Telangana Celebrate the Birthday of Great Indian Mathematician Sri. Srinivasa Ramanjun as National Mathematics day on 22nd December in all TS /AP Schools as per the SCERT, Celebration of National Mathematics day on December 22nd, 2016. Conduct Maths Day Computations Class wise levels - 3, 4, 5th Classes One level Group and 6, 7, 8th Classes Students two level and 9th, 10th Classes Level another level Group. Thanks for sharing information about December 22nd National Mathematics day event.i think on this day we are memorizing great Indian who made good contribution towards mathematics. Why can you find this idea? It's super excellent. You are so talented hotmail login.